At Jedediah Smith Redwoods State Park in northern California, the best thing you can do is stay in your car. That's because the hour-long, six-mile drive through the park on Howland Hill Road is pretty close to a tour of heaven, or so some people say. Besides taking that breathtaking drive, you can also play in the longest major free-flowing river in California or set up your campsite under towering trees in one the state's cleanest campgrounds. Along with Del Norte Coast and Prairie Creek Redwoods parks, Jedediah Smith is part of the Redwood National and State Park. Together, they protect almost half of California's remaining old-growth redwoods, trees whose average age is 500 to 700 years. It's an area so important that it has been named a World Heritage Site and International Biosphere Reserve. Howland Hill Road is about six miles long, a meandering drive that is one of the most intimate and awe-inspiring redwood drives anywhere. 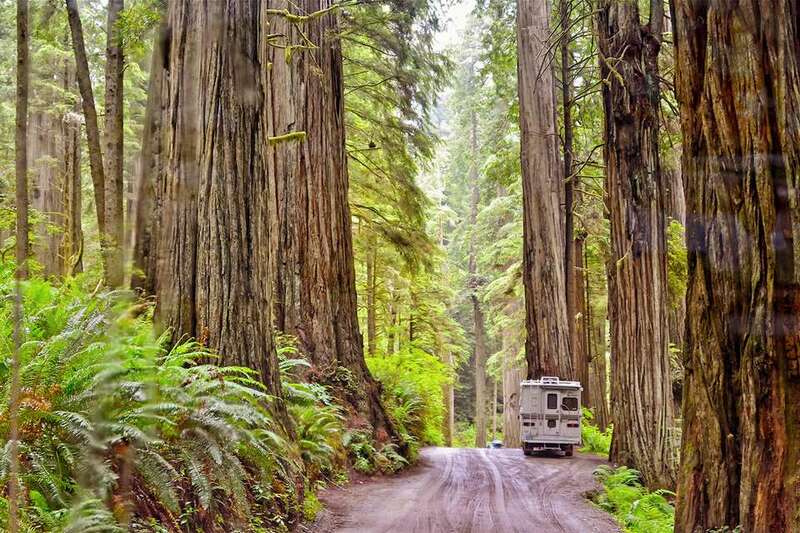 It is part of Northern California's most scenic drives: the Redwood Highway. It will take about an hour if you don't make any stops. If you're just passing through the area and thinking about skipping it because that hour will slow you down, don't make that mistake. It's a once-in-a-lifetime experience if you have never been in the middle of an unspoiled redwood forest. You can start your Howland Hill drive either from Crescent City or the visitor center near the town of Hiouchi on U.S. Hwy 199. Unfortunately, the Howland Hill drive is never suitable for large RVs or vehicles towing trailers. If the hard-packed gravel road has been graded recently, it's passable for a family sedan, but conditions can vary from smooth to deeply rutted. Your best bet is to check conditions before you start the drive. To do that, don't waste time looking online or calling the park. The only reliable way to get the current status is to stop at one of the park's visitor centers, which are in Crescent City and near the Hiouchi entrance. Park rangers at the campground entrances can also give you information. During the dry season, vehicles stir up plenty of dust on the unpaved portion. Keep an eye out for potholes no matter what time of year it is. If you don't have time for the whole drive or road conditions prevent driving its full length, try to get as far as Stout Grove, which is at its most photogenic in the early morning or on a sunny afternoon. The 0.5-mile loop walking trail is accessible to all. To get to Howland Hill Road from Crescent City, turn east onto Elk Valley Road from U.S. Highway 101. Follow it for a mile and turn right (east) onto Howland Hill Road. The road becomes unpaved after about 1.5 miles. After you get back on the pavement on Douglas Park Road, turn left onto South Fork Road. That will take you to the junction with U.S. Highway 199. To get to Howland Hill from Hiouchi, turn onto South Fork Road, then right onto Douglas Park Road. Keep following the road until the pavement ends (where the road name changes to Howland Hill Road), then drive over the hill and turn left onto Elk Valley Road, which will take you to U.S. Highway 101. You can fish, snorkel, or kayak in the Smith River. From October through February, anglers can catch salmon and steelhead during their seasonal runs. In summer, try fishing for cutthroat trout. Anyone over age 16 must have a valid fishing license. The park's hiking trails range from as short as a half mile to ten-mile strenuous hikes. Park rangers can help you choose the hikes that are best for your ability and interest. Rangers also hold campfire programs at the Jedediah Smith Campground. Jedediah Smith Park has 89 campsites that can accommodate trailers to 31 feet long, as well as campers and motorhomes up to 36 feet. Reservations are recommended between Memorial Day and Labor Day. Find out how to make reservations at California state parks. To choose a campsite, check the campground map. Online reviewers recommend campsites with numbers in the high 50s, which are furthest from the highway and closest to the river, with lots of privacy. Among those, the ones that back up to the river are especially nice. Sites numbered in the 40s are also good, but somewhat closer together. The park has an RV dump station, but you will have to carry water from water spigots to your campsite. Black bears live in and around the park. Most of them stay away from people. To keep them from getting used to finding food in the campground, all campsites have bear boxes they can't get into. Find out how to stay bear safe in a California campground. Four cabins, all of which are ADA accessible, are located within the Jedediah Smith Redwoods Campground. They have electricity, heaters and lights but they're more like a hard-sided tent than a cozy cabin in the woods. They don't have bathrooms or kitchens and you can't cook, smoke or use an open flame inside. Cabins each have an outdoor barbecue, fire pit, bear box, and picnic bench. Each cabin can accommodate up to six people with two bunk beds, each with a twin bed above a double. Beds don't have mattress pads and you have to bring your bedding. You can pitch a small tent outside the cabin to accommodate up to two more people. Pets are not allowed inside the cabins. The park and campground are open year-round. There is no admission fee for day use. Get more details at the park's website. Some visitors complain about mosquitos during the summer. If you plan to camp or hike in the park, bring repellent. Poison oak grows in the park. If you're allergic to it, you probably already know how to identify and avoid it. If you don't, its leaves grow in groups of three and are never side by side. Find out more about what poison oak looks like. Summer temperatures at Jedediah Smith range from 45 to 85°F. Winter can be rainy (up to 100 inches of it), and temperatures are between 30°F and 65°F. Snow is rare. The park is northeast of Crescent City. You can get there by driving Howland Hill Road using the directions above or by entering from Hiouchi on U.S. Highway 199.